Second Avenue in East Harlem is a wide stretch of road lined mostly with century-old tenements. Makes sense—most of them date back to when the Second Avenue Elevated opened up northern Manhattan to developers, who built row after row of walkup buildings for New Yorkers desperate to escape the slums of the Lower East Side. 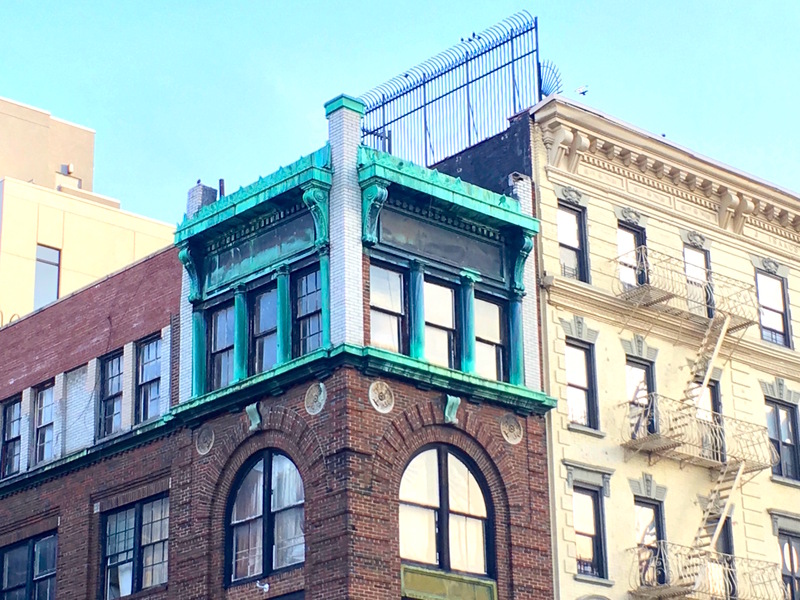 But there’s one building on the southeast corner at 109th Street that’s always come off as more elegant and distinguished along this longtime working class avenue. 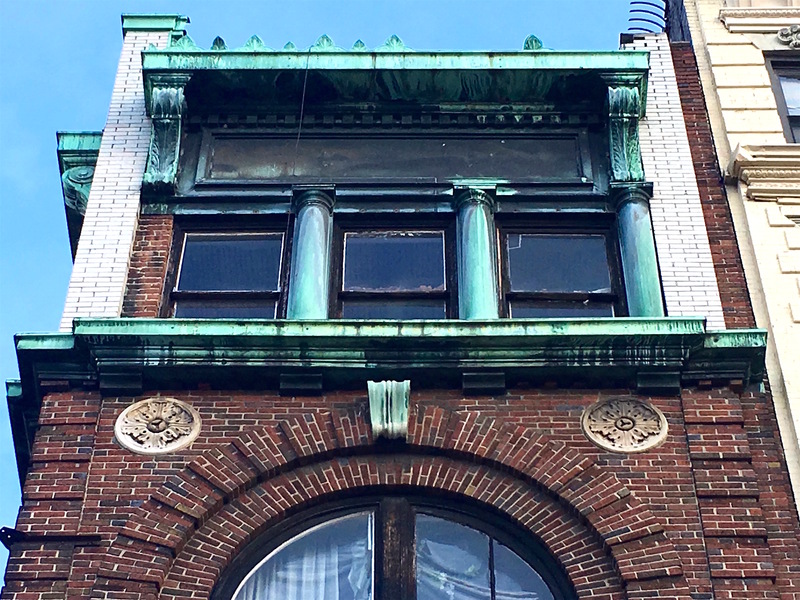 With its wide arched windows on the third floor, decorative garlands and wreaths, and green copper facade at the top corner, this was a building meant to impress. So what was it? A bank, apparently. Though the department of buildings website doesn’t confirm exactly when the building went up, it certainly looks like a bank from the early 1900s, with refined aesthetics meant to inspire confidence and trust. It’s also a little unclear what kind of bank this was. In 1918, a man named F.M. 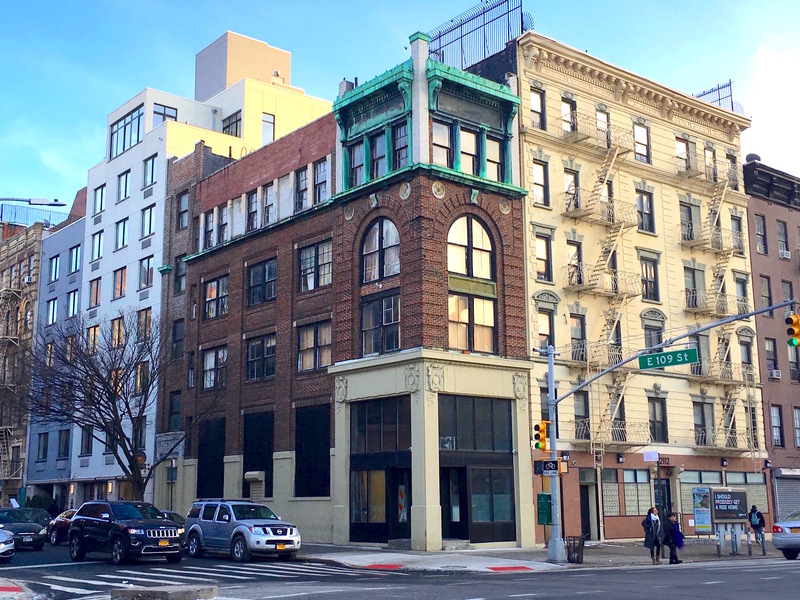 Ferrari and his partner, Giuseppe D’Onofrio, applied to operate a private bank here, with the address listed as 2112-2114 or 2118 Second Avenue. The city refused their application. 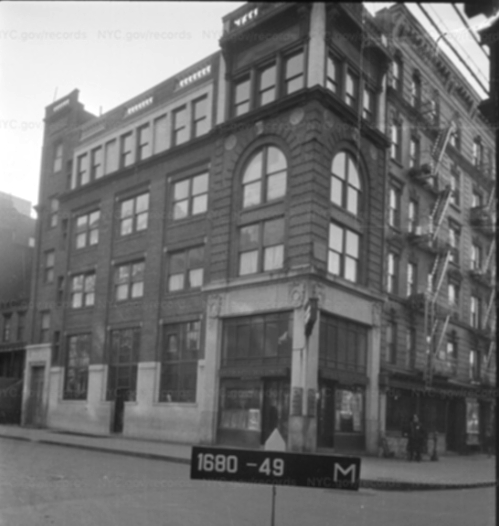 Yet by the 1920s, Ferrari was running a bank called the Harlem Bank of Commerce at this address. This was the center of Italian Harlem, at the time Manhattan’s biggest Little Italy—with 89,000 residents by 1930. That was three times the number of people in the Little Italy on Mulberry Street. With so working people, Ferrari’s bank likely had plenty of customers. 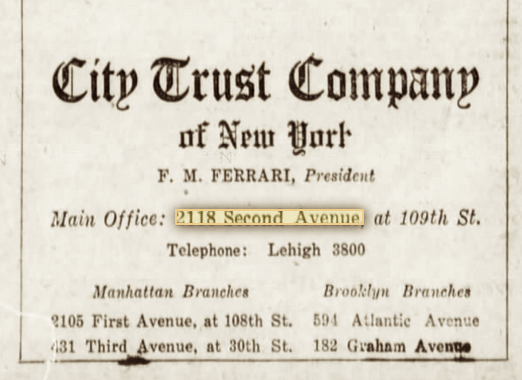 In 1928, Ferrari changed the name to City Trust Company, advertising bank vaults and other banking services. At some point, the bank disappeared, and the building was occupied by a mystery store (see the 1940s tax photo, above left), a small factory, and offices. 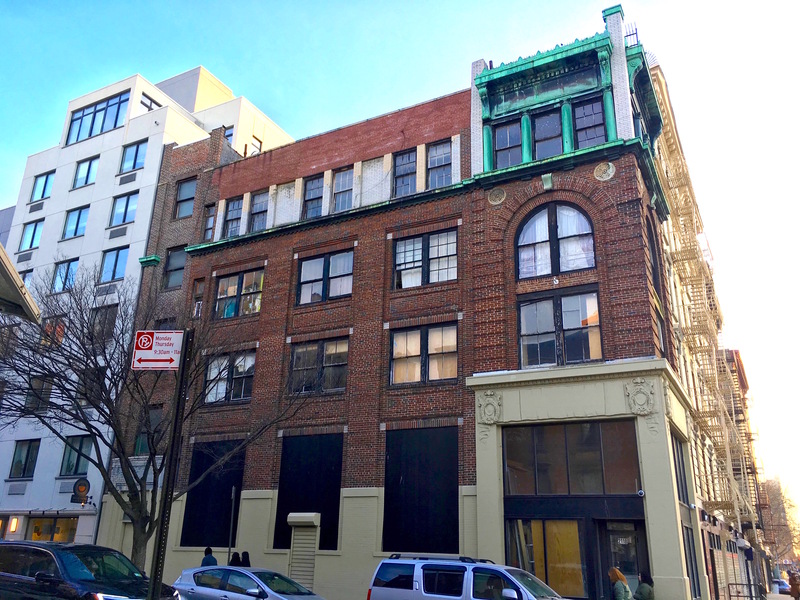 Today, East Harlem’s copper-topped building seems unoccupied—its large first-floor windows covered up, and its side entrance at 300 East 109th Street looking abandoned.